These antiqued bronze cufflinks feature images of the golden record from the Voyager probe. He wore his NASA nerd cred on his sleeve. 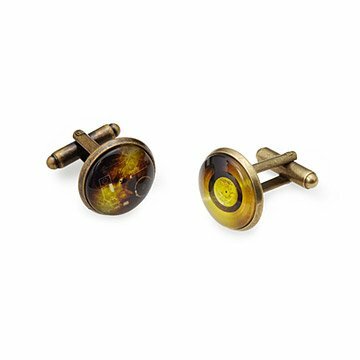 A sartorial celebration of space exploration, these antiqued bronze cufflinks feature images of the golden record from the Voyager probe. Developed by Carl Sagan and his team in 1977, the records include an array of sounds and information representing the rich diversity of life and culture on earth-- recordings that one day may be heard by curious extraterrestrials. Each pair of cufflinks shows the two sides of the original record. They make a great gift for well-dressed guys who look to the stars. Handmade by Lauren Beacham in Maryland. It really goes well with any attire. I gifted two of them to two different business man and they were very thankful and loved the thought. Besides it's uniqueness!